April 15, 2018 Victoria, BC (ISN) – The VIRU’s 2017-2018 Barnard Cup was claimed yesterday in narrow fashion as the Castaway Wanderers would win Vancouver Island’s top prize 27-26 over the UVic Vikes in the regular season race. The Cup travels to Windsor park this year from last year’s James Bay Club house where the Bay’s held the title with a 18-10 defeat over CW last years island battle. Down to the final regular season game, the UVic Vikes wouldn’t play dead for CW, who enjoyed a four-point advantage going in to the Saturday afternoon game. In what could be thought as more a moral victory for the Vikes with playoff seeding decided, CW would press late but fall short on a penalty to drop the final regular season match 32-31. CW would jump out to an 8-0 lead on an early penalty kick and a try by Josiah Morrah. Leading most of half, Vikes penalties would give the home side the points advantage after one half of play up 16-12. CW would appear to dominate in the scrum to enjoy the short side of the field most of the half. Morrah and Nanyak Dala would put the ball down for the Castaway Wanderers, while UVic would reply with James Pitbaldo and Brennig Prevost in the first 40 minutes of play. CW would rely on Mike Adibe’s boot for two successful penalty kicks. UVic, hoping to quell penalty whistle in the second half, would take adavantge of a CW penalty to pull close 16-15 in the first two minutes of the second frame, however a Vike’s yellow card assessed James O’Neil would result negate the effort after a successful CW try by Clayton Thornber would ignite a three try burst by the tri-colors to jump out to a 31-15 lead midway through the final half. Castaway Wanderer’s Brett Johnson and Josiah Morrah (2nd) would be the beneficiaries of the remaining two trys. The Vikes, not to be outdone, still had something to show the partisan Castaway Wanderer fans despite down sixteen points with less than twenty-five minutes remaining in the game. UVic’s Gavin Kratz would start their comeback bid with a hard-earned try to cut into the CW lead 31-20. CW would threaten to score from about 20 meters out when UVic’s Grady Bowd would take advantage of CW turnover to carry the ball the remaining length of the field for the Vike’s fourth try of the game 31-25. CW would find themselves backed up one last time as a stalwart effort by the Vike’s down low to push the ball forward would not go unrewarded for UVic’s Liam Morrison, whose try would put his team a conversion kick way from the lead. The successful kick would give the Vikes a 32-31 lead. The Barnard Cup champions, looking dangerous, would get one last opportunity at the win when the Vike’s would be unsuccessful at clearing the ball from around the ten metre mark with one minute remaining, turning the ball over. Sweet opportunity would turn sour however as the Castaway Wanderers would be called for a knock on out of the scrum to put the ball back in UVic’s hands. The Vike’s, using the remaining time wisely, would secure the 32-31 win. 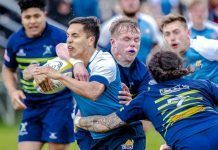 Both sides will now advance to the BC Rugby Union playoffs, which begin April 21st. Castaway Wanderers finish in fourth place in the BC Rugby Union Premier League, while the UVic Vikes hold onto fifth spot. If all holds true the first playoff round could be a CW – Vikes rematch.